Students from London Metropolitan University have spent the past year working in and around Elephant and Castle, trying to gain an understanding of the people and area and looking at the developer’s proposals for the Heygate Estate. They have produced a collection of projects which aim to critique the developer’s masterplan proposals by presenting alternative proposals based on their interaction with local residents, and with specific studies of not just the estate but the wider area. One project has considered how you can encourage successful public space and integration of new and existing residents in relation to the developer’s proposals for tall buildings. Another looked at how the new proposed market square links and functions with the existing Shopping Centre markets. Another met with residents at Walters Close and to inform proposals for a sheltered housing scheme for the new development. Some examples of the work are shown here: http://tinyurl.com/c2d2x39. The projects are to be exhibited at Crossway Church on Tuesday 14th August, Friday 17th August and Wednesday 22nd August. Elephant Amenity Network has submitted a letter of complaint to Soundings who have been managing the consultations for Lend Lease’s regeneration of the Elephant and Castle. The letter asks that the serious misrepresentation of the amount of affordable housing that was presented at the consultation be taken into account at the planning committee stage . The letter was also sent to Sarah Gaventa, who has been the Chair of the Lend Lease-created Regeneration Forum. We are publicising the letter here (and elsewhere) and asking that local people and groups add their name to it. If you support our statement then please email us your name and we will add it to the signatories. The consultaton for the outline planning application for the proposed Lend Lease development at the Elephant & Castle, in the Heygate Estate area, has now officially closed. But due to the complexity of the application (191 documents to support the developer’s application…) the Case Officer at Southwark Council has confirmed that subsequent comments will still be considered. 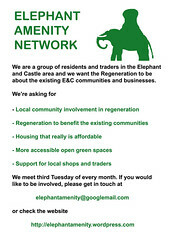 The Elephant Amenity Network has made a formal request to the Chair of the Planning Committee to hold the consideration of the plans over two or three days, rather than the one evening usually allocated, as this is the largest and most complex planning application ever seen in Southwark, with both local and London-wide implications. Our objections and comments, collated from members across the network, have been submitted. The text is shown below. The applicant’s documents, and other objections, can be found (applicaton 12/AP/1092) on southwark council’s website here by searching for application reference 1092. 1.1 We have concerns about the financial viability of the development scheme but are excluded from any meaningful discussion of this aspect of the application because we are denied information that is deemed confidential to the applicant (eg the Financial Viability Assessment). Has the site now been formally and contractually sold, so that the Council has a capital receipt, or is the sale conditional upon the approval of outline planning consent or completion of demolition? If the land is being transferred to the applicant on a phased basis, what are the phasing arrangements for this? What other conditions might there be to any sale and will the Council be seeking equity retention or imposing any covenants on the land? Is the sale on a freehold or long leasehold basis? What are the modelling assumptions informing the viability assessment? Is viability being assessed according to the Residual Land Value method – whereby the consideration paid for the land is based on what is remaining after the deduction of all costs and planning obligations (i.e. 35% affordable housing). Or is the viability assessment based on a ‘Market Value’ approach – whereby the land consideration is included as a fixed cost to the scheme, and the planning obligations are altered according to what is viable after the fixed costs have been covered? What is the precise legal/contractual basis of the agreement for the minimum percentage of 25% affordable housing? What legal recourse has the Council should the applicant not meet this percentage? How might the transfer of ownership to the applicant affect its capacity to raise funds for the scheme in the current financial climate? 1.3 Generally speaking, it is accepted that commercial confidentiality is a valid consideration for the applicant, and could compromise its position in future development negotiations by disclosing its build costs, credit costs, etc. However, the disclosure of information relating to the basic modelling assumptions of the viability assessment and details concerning the transfer of public land is in the interests of the local community, particularly since a thousand households had to give up their homes and the applicant will be benefiting from a large transfer of public land and significant investment of public funds. 1.4 Furthermore, many of the original benefits of the scheme are being lost on the grounds that they are financially unviable (eg the MUSCo, affordable housing), while the local community can make little independent judgement of the accuracy of the applicant’s claim. 1.5 We propose that an ‘open book’ approach is needed, whereby the basic modelling assumptions and main inputs of the viability assessment are made public and local people can have meaningful involvement in deciding how the benefits of the regeneration should be shared. 2.0 We have serious concerns about the poverty of the consultation process. The lack of relevant information (due to commercial sensitivity, oversimplification of what was presented and lack of clarity as to which issues were of material consideration) meant there was no genuine dialogue possible. The framing of the questions and statistical methodology is problematic and the consultation relies on unrepresentative numbers of people consulted. One of our members is producing a detailed analysis of how the consultation process was neither sound nor effective, and failed to meet formal requirements, and we will forward this. Importantly the consultation process was misleading on the issues of affordable housing (see 2.1) and sustainable development (see 2.3). 2.1 The pre-planning application consultation process has not raised the possibility of the development providing less than 25% affordable housing. At both the exhibition in February and the Housing Workshop on 29th Jan, the local community was told that the outline planning application would include a minimum of 25%affordable housing. This has proven not to be the case; instead there will only be ‘as much affordable housing as is financially viable….’ (Planning Statement and the Housing Statement (8.1.4)). The reference to 25% affordable housing in the Draft S106 Heads of Terms does not amount to a commitment to build 25% affordable housing; it gives no figures for either the ‘Policy Compliant Contribution…’ or the ‘Approximate total…’. The planning case officer has also confirmed that the 25% minimum is not part of the application. Throughout the Statement of Community Involvement (SCI) it is clearly recognised that affordable housing is “central to the discussions” (p107 of SCI). Here are several examples of how this matter was misrepresented: – The board on p61 of SCI – The boards on p12, 16 of Appendix 1 of SCI – The board on p39 of Appendix 3 of SCI – The board on p51 of Appendix 4 of SCI – Feedback form on p61 of Appendix 4 of SCI – The board on p79 of Appendix 5 of SCI – The board on p87 of Appendix 6 of SCI 2.2 We propose that the officer’s report should now state that the local community was neither informed nor consulted about the amount of affordable housing being less than 25% and this should be taken into consideration by the planning committee. 2.3 Nor has the pre-planning application consultation process included consultation on the feasibility of using biomethane gas as fuel for the development’s new district heating system (indeed the workshop on sustainability specifically ruled out biomethane use) yet the applicant now proposes such use. 2.4 We propose that the officer’s report should now state that there has been no consultation on the feasibility of using biomethane gas and that this is taken into consideration by the planning committee. 3.1 We have concerns about the amount of open and green space in the development, as well as access to and management of this space. The footprint outlined in the planning application currently contains a total of 2.42 hectares of amenity open space#. The proposed park will contain just 0.8 hectares – an unwelcome loss of more than two thirds of the existing amenity open space. 3.2 We object to proposed management arrangements for the new park. While the amenity space on the Heygate was primarily for the residents it is to all intents and purposes ‘public’ land, managed by the Council and openly accessible. The new development will have 13 separate Plot Management Companies (PMCs) under one umbrella Estate Management Company (EMC). The PMC’s will be controlled by home leaseholders, registered social landlords and retail leaseholders. We note that social rented tenants and private tenants are excluded; we think this is unwarranted and object to it. 3.3 We also fear that the PMCs and EMC will introduce unwarranted restrictions on the activities and the use of the Park. 3.4 We also have concerns about the ‘Town Centre Security Team’. There are no details as to what this is – its size, powers or to whom it will be accountable. Our concerns are informed by our experiences in other places (eg the Shopping Centre, More London), where the security behaviour is often officious and overly restrictive. 3.6 In line with this principle we therefore propose that the estate management should be entirely reconsidered and that Southwark Council adopt and manage the streets and public areas of the development. This public area must include the new Park and unrestricted 24-hour access to the area must be assured. These should be conditions made on the approval of outline planning application. 3.7 We strongly object to the off-site provision of recreational space for older children (i.e over 12) rather than on-site provision (Play Strategy, Landscape Strategy, pg 93). The reason given is that on-site provision “is not considered practical or desirable, in respect to the intended character, use or scale of the space”. Local young people will be purposely and actively excluded from the new development area should this proposal be accepted. It also appears to be discrimination on the basis of age, a contravention of the Equalities Act 2010. 3.8 Finally on this matter the Estate Management Strategy and the privatised public realm that will result from this development have not been addressed in Lend Lease’s Equalities Impact Assessment. 4.3 Regarding supply of utilities we note that the existing standard gas-fired boiler and district heating network, is being replaced with a new standard gas-fired boiler and district heating network, servicing just the new Heygate development. The existing network supplied heat and hot water to over 2,000 homes on the Heygate and neighbouring Salisbury estates; the new district heating network will not extend beyond the Heygate footprint and will not supply telecoms, potable water, non-potable water, drainage, gas, fibre-optics and vacuum waste as the original Multi Utility Services Company (MUSCo) was designed to do. 4.4 We note that all methods of supplying heat and water that rely on renewable sources of energy have been rejected on grounds of their cost impact on viability. The applicant suggests that at some point in the future it might be able to source some of its gas requirements through biomethane injection offsetting. We understand that this is still very much an untested technology experiencing widely acknowledged technical difficulties. To our knowledge there are currently no operational biomethane plants injecting with any capacity into the UK gas network. Biomethane injection is also not listed as an ‘allowable solution’ for carbon offsetting in the UK. We therefore believe that unless the applicant makes a firm commitment to constructing a biomethane plant, then this proposal is unrealistic and should not be taken into consideration. 4.5 We note that the developments new homes will not be built to 2016 CSH level 6 but only to CSH level 4. These will not be zero carbon homes. We therefore object to the application and propose that it is amended to include a firm commitment either to construct a biomethane generation plant or install a biomass CHP boiler and ensure that all homes are built to CSH level 6. 4.6 We are also concerned that the application will not meet Core Strategy requirements for carbon emissions and object to the application because it does not include embodied carbon within the carbon accounting methods. This point has been raised in the sustainability workshops with Lend Lease and we have requested access to the relevant consultant’s (Deloitte) report. We will supply further comment on this once the report is made available. 4.8 A council briefing paper from Regeneration (15th September 1999) stated: “It will be pivotal to the success of the Elephant and Castle project that it be treated as a single unified programme”. From the planning application, it would appear that the applicant is only looking at the area in the context of this particular site and not the overall opportunity area as a whole which involves other developments. Moreover, by splitting the Heygate scheme into two separate applications in spite of the fact that they are covered by the same regeneration agreement, we believe that the scheme has been artificially divided as a means of circumventing an assessment of the cumulative impact of the scheme as a whole. This is a clear breach of the 2011 Environmental Impact Assessment Regulations. The Heygate East application (Phase 1 – Rodney Road.) expected shortly, should therefore be considered together with this application. Furthermore, the applicant’s tree survey is inaccurate: it claims that the trees on the site are around 40 years in age: 6.1 “The existing trees on the Heygate Estate were planted around 1970 and are around 40 years old.” According to the 1968 planning brief for the Heygate estate, the trees were planted as mature saplings and were around 20 years old when they were planted. This makes them at least 60 years old today. what percentage of the jobs is likely to be provided to local residents, whether the existing local supply and demand for retail and catering work actually support the development proposal. To overcome our objection the application needs to be revised, or a condition imposed, to provide a target for local jobs, define the catchment area that is local, and the training and support required to realise this. 5.2 We also object to the application because the Retail Impact Assessment does not assess the development’s impact on existing retailers on the New Kent Road, Harper Road, Rodney Road shopping parade, East Street market and the Latin American retail on Elephant Road and Eagle’s Yard. We fear that the impact will be negative and lead to the displacement of existing retail. 5.3 To mitigate the impact of the development, s 106 support needs to be given through a long term commitment to affordable retail units for these existing independent traders and shops and through improvements to appearance and public realm. 5.4 The application needs to be revised so that it recognises the important contribution of small retail units and street markets surrounding the development site. 5.5 The application needs to be further revised so that it recognises the contribution of minority ethnic businesses to the variety of retail offers in the area and to cultural diversity, and particularly gives recognition to the 70 Latin American businesses at the Elephant and Castle which with the right support and commitment could be transformed into a thriving Latin American Quarter, giving a distinctive character and identity of place. 6.1 We support the comments of Southwark Living Streets on this matter. 6.2 The Council should retain its vision of zero car parking in new developments. The PTAL level at the site is 6b – the highest level of accessibility, so we question the applicant’s insistence on 25% parking as a baseline for the future. We believe that with a 10% provision for disabled parking and a further 5% for car clubs, the need for private vehicle usage should be minimal. 6.3 We note that other recent developments containing high value properties are delivering far lower ratios of car parking than are proposed for the Heygate development. Strata Tower which has been completed has a ratio of 0.14 cars per unit and the consented Oakmayne development 0.11. 7.1 We support the comments of Southwark Living Streets in this matter. 7.2 Little regard should be given to the PERS scores that were identified for the area surrounding the Heygate development. The predominance of green scores throughout for Links, Crossings and Routes indicates just how inappropriate a methodology this is to assess the quality of the walking environment. No part of the TfL managed pedestrian environment in the area is fit for purpose and these assessments should be disregarded. 8.1 We support the comments of Southwark Living Streets on this matter. 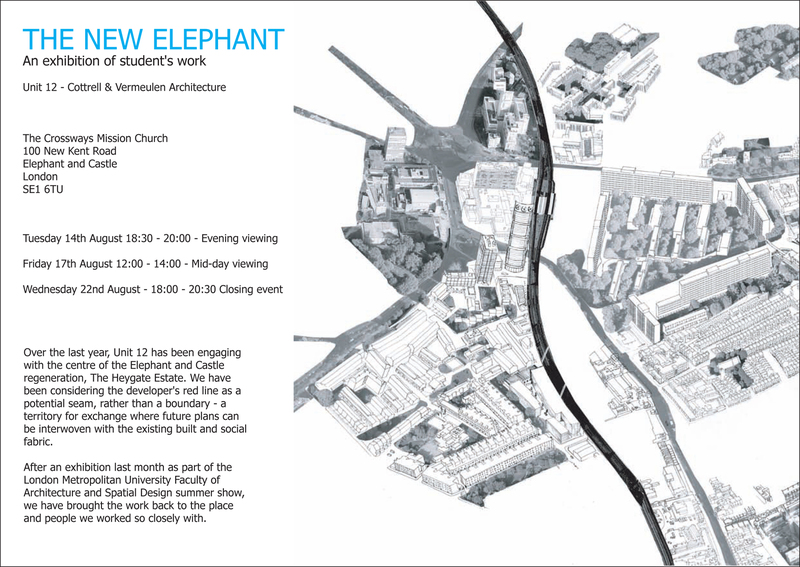 8.2 We note the absence of a crossing of the New Kent Road at the northern end of Elephant Rd (Access Statement p 10). A crossing is needed here to allow pedestrians and cyclists to reach the newly created route between the housing development and the railway viaduct on its south-eastern flank. This would provide an excellent cycling and walking route between the NKR and Rockingham St and then on to Trinity Church Sq., Borough High St and London Bridge. 8.3 More thought needs to go into the definition and design of the Tertiary vehicle routes (including the Central Shopping Street and The Promenade) throughout the development and there should be a commitment or planning condition requiring consultation with a range of local interest groups including disability groups. For pedestrians to feel comfortable and be genuinely safe the streets should be designed to allow vehicles to move at no more than 10mph. This requires a far more intrusive design than simply shared surfaces. The reality is that these should be access only routes rather than through routes of any sort, in order to reduce the usage by vehicles. 8.4 The design of Rodney Rd between the junction with Rodney Place and the Orb St junction appears to have been given insufficient attention. At present vehicle speeds are high and nowhere near the 20mph maximum envisaged throughout the area (as set out in the E&C SPD). This section of road has been largely forgotten in spite of the excellent work done to design other routes and roads in the area. Thought now needs to be given to reducing carriageway capacity and vehicle speeds throughout this section. This is vital if east–west pedestrian and cycling movement is to be successfully encouraged. We object to the applicant’s inadequate consideration of cycling, both in terms of trips generated by the development, and in terms of the impact of the development on trips passing through the development area. The data provided in the Transport Assessment omits any consideration of existing, generated and future underlying levels of cycling. In contrast there is extensive use of transport models to examine car trip generation and to model pedestrian access to public transport. In essence, then, this application fails to meet the SPD requirement in that there is no data provided or estimated about cycle “desire lines” or any attempt to capture the existing volume of cycling on the cycle bypass and through the adjacent Northern Roundabout. However the developer makes no proposals to improve the strategic routes for cycles. The Halcrow report (Transport Statement App E) into the Northern Roundabout does not consider cycling volumes at all, anywhere. This makes the recommendations about the design unsound. Given recent mayoral statements about Bow roundabout, and given that this junction has the highest rate of cycle casualties of any junction in London, this is an outrageous omission. Thus the developer refuses to address, or even measure, commuter cyclists’ needs, whilst ignoring their needs on the strategic road network despite recognising that the development will increase traffic levels on this network. 9.3 Existing Cycle Routes – We also note that the development will have a negative impact on existing routes. The existing heavily used London Cycle Network route from Camberwell up Portland and Brandon Street along New Kent Road and into the E&C cycle bypass will be significantly worsened by the huge increase in bus and car traffic planned for Rodney Place and Heygate St, as shown in the diagram below, whilst the alternative fails to respond to the consultation undertaken during development and provides a circuitous alternative route with several potential conflict areas with cyclists. Rodney Place and Heygate Street will become a major conflict point for pedestrians and cyclists given the massive increase in traffic expected here. The proposed alternative route is hugely circuitous and faces numerous potential conflict points with pedestrians. This is despite the Statement of Community Involvement showing clearly that a direct route from Brandon St over Heygate St and to New Kent Road was widely requested. 9.4 Cycle Parking – Finally, we believe that the cycle parking is inadequate. Despite stating that the proposals are based on the “emerging London Plan standards and SC standards”, they make no commitment to any spaces, saying only “A maximum of 3,136 spaces are proposed, which includes spaces for visitors to the proposed Development.” The developer must be asked to provide a commitment to minimum number of spaces and at a level significantly above London Plan standards given the excellent location of the development where any part of central London is within 30 minutes cycling time. 9.5 Northern Roundabout – Finally, we are astonished to read in the Halcrow Report (App E) that “it is the intention of Lend Lease, TfL and SC to see part of the strategic transport tariff utilised to implement a new highway design of the northern roundabout. The design is discussed further in Section 11 of this TA. One of the key considerations of this design is to provide safe crossing at surface level and a safer junction for all users.”. A laudable aim, but unfortunately the report does not mention cycling once and therefore does not begin to consider all users. Thus only has Lend Lease not included any quantitative assessment of cycling volumes and requirements in their analysis, at key collision blackspot, they are proposing to widen the roundabout to provide five lanes of motor traffic. This will increase speeds and thus danger to cyclists and an alternative design must be requested of the developer, to be developed in conjunction with the relevant user groups. 10.1 The applicant fails to quantify s106 spend on affordable/ social rented housing (Draft Section 106 Heads of Terms). Given the policy requirement to deliver at least 35% affordable housing, and the claims of viability studies that in current economic circumstances 25% affordable housing is the optimum that can be delivered, it is imperative that a significant amount of s106 supports affordable housing. 10.2 Further, it is essential that the s106 contributions for affordable housing are ring-fenced for social rented housing to ensure that the social rented housing targets can be met in what is a challenging economic environment. 10.3 The applicant also fails to provide for a library/ lifelong learning centre, buildings for use by voluntary and community sector groups and the kind of comprehensive range of facilities promised by the 2004 Elephant and Castle framework document. Provision of these facilities should be a condition of the outline planning application’s approval. 10.4 We further propose that a planning condition requires the applicant to involve the local community in determining all aspects and details of these facilities. 10.5 We are also concerned that an inordinate proportion of the total spend will be on transport infrastructure (ref Draft S106 Heads of Terms) at the expense of affordable housing, education, employment, public open and play space, public realm, health facilities and community facilities. 10.6 It is evident that neither S106 nor the Community Infrastructure Levy will be sufficient to fund the necessary improvements to the transport infrastructure that the development entails, but that transport will nonetheless drain most resources from the S106/CIL fund. 10.7 We therefore propose that alternative funding is used for transport infrastructure and that non-transport categories of S106/CIL expenditure are ring fenced as a condition of approval of the outline application. 11.1 We object to ‘affordable rent’ forming any part of the affordable housing offer (ref Housing Statement 8.4 Viability). The rents given as the ‘maximum affordable percentage of Market Rents’ range from £184.29 (1bed) to £368.43 (4 bed) (ref Table 8.3) percentages translated into figures) and will be beyond the means of most local people and of the many thousands on Southwark’s housing list. (Rents at this level may also have the perverse outcome that only those in receipt of housing benefit amongst low income households will be able to afford ‘affordable rent’ units (Table 8.2)). 11.2 We note the applicant’s contention that in SE17 “all households excepting those with 3 or more children (are) able to afford the higher levels of Affordable Rent” with reference to Table 8.1 ie rents of £275-£321 pw. This is both surprising and confusing, as it follows paragraphs dealing only households on with Universal Credit and so needs clarification. 11.4 We note that the applicant instead commits to building only “as much affordable housing as is financially viable….” (Planning Statement; Housing Statement (8.1.4)) and does not fulfil the commitment to build a minimum of 25% affordable housing made in the Regeneration Agreement. While 25% would be the minimum under the Regeneration Agreement, it would nonetheless be a clear breach of policy. 11.5 It is also noteworthy that £18,100 annual income is the lower limit of the range for affordable housing in the London Plan (Housing Statement 8.3.14). The applicant should be required to state how they will provide intermediate homes for this income level as a condition of approval of the planning application. 11.6 We note that the applicant says that the residential mix will conform to the Core Strategy (ref Housing Statement 7.3.3) and that the dwelling size will conform to the Affordable Housing SPD (8.5.1); nonetheless we do not believe the applicant has submitted sufficient information for the local authority to determine the application. The application omits the tenure mix and levels of affordability for each tenure (merely rehearsing the issues around the latter). Unless the outline application specifies the tenure, residential mix, affordability and space standards it cannot be determined as policy compliant. 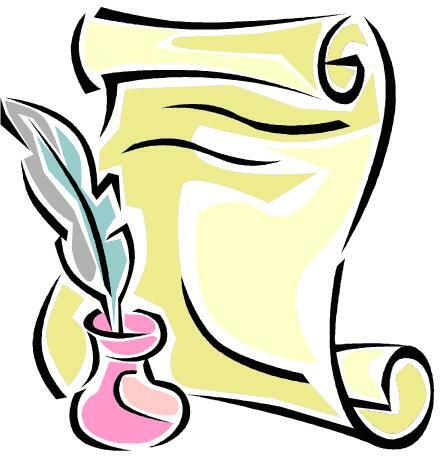 11.7 This information should also be part of the Development Specification as a condition of the outline application (with detailed information for individual phases or plots as these may be variable). Subsequent detailed applications should require a justification for a phase which varies from the original consent. This allows the Council to respond to changing needs and for the financial viability to be reassessed. Each new detailed application would also be subject to full consultation. 12.1 We object to the applicant’s tall buildings strategy. The buildings proposed for the frontage of the Park qualify as ‘tall’ according to the Core strategy and should be treated as such. We intend to submit further comment on this point. 12.2 We are concerned that the tall buildings will have a negative effect on micro-climate, particularly sunlight, shading and ground level wind canyon effect. We will consider further the applicant’s studies and respond on this point. 12.3 We object to the tall buildings lacking public accessibility. This could be remedied through public viewing galleries, exhibition spaces, museums at the top of some of the tall buildings. 12.4 We object to the building blocks/ massing being overtly gridded, as this arrangement will feel as monolithic as the blocks being replaced. This can be remedied by the design of the blocks incorporating small pedestrian passage ways, short cuts and small shopping arcades. 12.5 We object to the cluster of tall buildings being separated physically or practically from the surrounding community, so that the effect is of a “gated community”. 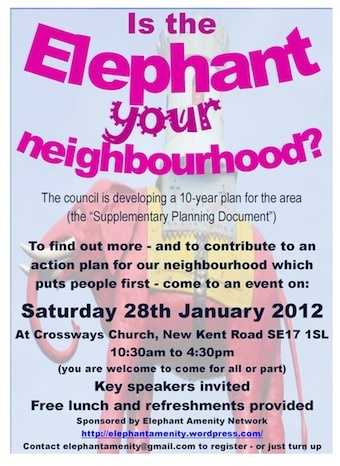 You are cordially invited to a neighbourhood event at Crossways Church SE17 1SL organised by the Elephant Amenity Network on 28th January 2012. It divides the Elephant into “character areas” (neighbourhoods) and makes some detailed plans – but it is critical that people who live and/or work in the area are involved – this is a real opportunity to influence the future! The event starts at 10:30 sharp, and the morning will have detailed workshops on each character area – you are free to choose the one most relevant to you. The morning events runs to 13:00 when refreshments will be served. In the afternoon (from about 13:45) we will start three area-wide workshops on housing/sustainability, green links and shopping/employment. The event ends at about 16:00. There will be speakers from the council, and from other neighbourhood forums in SE London. Southwark council have now (16th November) released the latest draft of the supplementary planning document for the Elephant & Castle. This document is of critical importance to the future of our area – it sets the guidelines that developers, including Lend Lease on the Heygate and other sites, will have to follow. It goes to cabinet on the 22nd November, and the formal consultation period stretches between 27th December 2011 and 7th February 2012. An officer from Southwark Council will attend the next EAN meeting on 13th December to present the draft document and listen to initial feedback, all welcome to attend. From 19th October to the 22nd October, Lend Lease are displaying their “concept” masterplan at the hub on Walworth Road. We encourage you to go and have a look, and to comment. And some photos from the exhibition courtesy of the People’s Republic of Southwark are here. But commenting in a meaningful way is very difficult – not least because the council is developing their wider policies, to be set out in an “Special Planning Document” for the area, in parallel with this masterplan. That means there are no parameters for evaluating the concepts being displayed, which is how developers like it. Why is this? Because after 15 years of stalling and nothing, there is now a desperate rush to get something built. Car parking is one reason why this is important. A key public, wider, benefit of the original masterplan was going to be provision of surface crossings of the Northern Roundabout. The Mayor has now vetoed this because of impacts on traffic – and if even a small percentage of the thousands of flats here are going to have car parking, that will put many wider benefits of the regeneration at risk. Recent policy has been for this to be a car free development – reflecting the fact that Elephant has two underground routes, is on Thameslink, and has a huge number of bus routes, not to mention that it is within easy walking and cycling distance of the City and the West End. That there are any trees on the concept masterplan is a huge step forward – the previous masterplan developed by MAKE showed none at all. On Phase it is still not clear which trees are to remain and how many more are to be removed, though the recent hugely patronising “consultation” there allows us to “prioritise” existing trees without saying what the plan is or why any have to be removed at all. And what are the private courtyard spaces going to be like? Will they be on the level, allowing trees to be planted, and to be passively enjoyed by the millions who will walk through the development? Or will they be elevated, as proposed on Phase 1, and therefore only for benefit or residents – raised above inefficient ranks of car parking spaces? And did Southwark Council approve Lend Lease’s “design brief” to their architects, which specifies 25% parking provision (and which is thus behind all the raised courtyards? These seem to to be entirely basic questions that a concept masterplan should be addressing – when will we be allowed to engage properly, with the benefit of a properly-consulted-on local planning policy guiding the developer and setting the parameters?